We got the cats a year or so apart, and Zoey was only about 10 weeks old when we saw her at a pet store, sleeping CUTEly in the window. Mack was about 4 months old when Nammy went to get him on a spur-of-the-moment decision one day with a friend of ours from another friend who lived just up the road in our town. Mack's arrival generated a flurry of picture-taking activity. I am still looking for the other 15 to 30 pictures that aren't posted here yet. Soon, they will be. 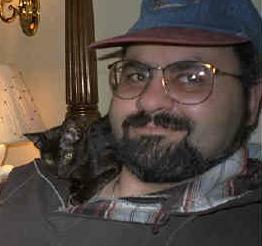 There are a couple of him sitting on my shoulder the way my little trouble sat on my shoulder several years ago in the picture you can see here. I must find those pictures. I think I know where they are. We're a quiet little family of potential predators, only the ones you would expect to hunt aren't the ones to worry about. For instance, the humans hunt nobody (atypical, eh?). The birds are potentially the most dangerous creatures in the house. What would life be without surprises?